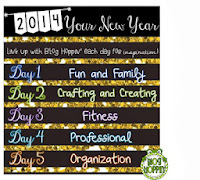 I'm linking up with Blog Hoppin' today. So, this post has nothing to do with school because we're still on vacation, and this is what's on my little mind. 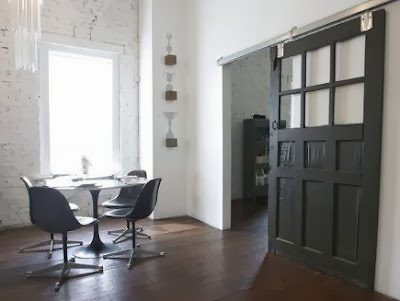 Using this photo from atticmag.com as my guide, I am attempting a similar vibe in a similar color scheme (or lack there of!) for a door in my kitchen. I know you're saying..."What was she thinking?" I was unable to find a door that I liked that was tall enough for my 9 foot opening, so now I am creating one with 2 old doors. The main door has "great bones" (as they say) and no fewer than 30 divided lites with wavy glass! It's amazing what makes me happy. So with a little help, and a lot of luck and more than a lot of elbow grease, this baby just might work out. I have 364 days left, right? Wishing you and yours oodles of happiness and creativity in 2014! Wow! Good luck on getting your doors to work! I am always impressed with someone who can take something old and turn it into something new and beautiful! Thanks for linking up on Blog Hoppin! Thanks Cindy and thanks for hosting!